Matt Kemp is an American professional baseball outfielder for the Los Angeles Dodgers in Major League Baseball MLB. The 34 years old professional has played for teams like the San Diego Padres and Atlanta Braves. Furthermore, he began his MLB career in 2006 with the Los Angeles Dodgers where he remained until 2014 and again returned in 2018. As of 2018, Kemp is receiving an annual salary of $21.5 million from the Dodgers. With an enormous earning, his net worth is approximately $75 million. 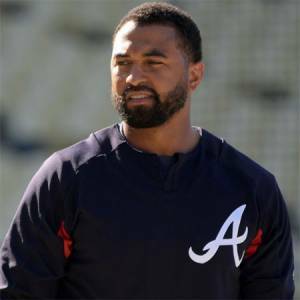 Matt Kemp was born as Matthew Ryan Kemp on September 23, 1984. He was born in Midwest City, Oklahoma, the son of Carl Kemp and Judy Henderson. He attended Midwest City High School in Oklahoma, where he was a standout in basketball and baseball. Talking about his nationality, he is an American citizen. Matt Kemp began his professional baseball career with the Los Angeles Dodgers in 2006. He made his major league debut with the Los Angeles Dodgers on May 28, 2006, against the Washington Nationals. His first Major League homer on June 1, 2006, he homered in three straight games from June 1–3 against the Phillies and homered twice on June 11 off Colorado Rockies starter Aaron Cook. He is also the first Dodger player to hit four homers in his first 10 days with the team. He became the starting right fielder in 2008 and hit his first career grand slam off of Mark Redman on April 26 against the Colorado Rockies. After driving in 11 runs and stealing 6 bases. He was named the "National League Player of the Week" for the week of April 28. He has won two Gold Glove Awards (2009 and 2011) and two Silver Slugger Awards (2009 and 2011) with the club. Matt Kemp was traded to the San Diego Padres along with Tim Federowicz on 11 December 2014. His first game for the Padres came on 6 April 2015, against his old team LA Dodgers. In a match against Colorado Rockies, on 14 August 2015, he became the first player in the Padres' 7,444-game history to hit for the cycle. Padres traded Kemp with cash considerations to the Atlanta Braves in exchange for Héctor Olivera on 30 July 2016. The coach moved Kemp to left field, a position he had started playing with the Dodgers in 2014. Kemp hit a double for the 1,500th hit of his career, on 16 September 2016, in a match against Washington Nationals. He became the first Brave to have a three home run game since Mark Teixeira in 2008, on April 29, 2016. On 16th December 2017, Kemp was traded to the Los Angeles Dodgers for Charlie Culberson, Adrian Gonzalez, Brandon McCarthy, Scott Kazmir, and cash considerations. Moreover, he was voted by the fans to start the 2018 MLB All-Star Game, his 3rd All-Star appearance, and 1st since 2012. He homered in his first career World Series at-bat in Match 1 of the 2018 World Series. Nevertheless, the Dodgers would lose the series to the Red Sox in 5 games. Apart from his professional career, Matt Kemp is popular for his relationship history. Though he has a strong dating history, he is currently single. His first notable relationship was with Letoya Luckett which popped out in 2006. However, the affair couldn't last longer than a year. He then started a new relationship with Felisha Terrell in 2007, which too didn't last longer than a year. Kemp too dated with Zena Foster, an American model in 2008 and ended up with a break up in 2009. He too was linked with Rihanna, the couple was together for 2 long years. Back in 2008, his ex-girlfriend, Terrell filed a restraining order against Kemp, alleging that she had been abused by him. Nevertheless, she later withdrew the accusation and her representative pronounced that the restraining order had nothing to do with domestic violence. Matt Kemp is one of the MLB stars with an estimated net worth of $75 million in 2018, including all of his properties and incomes. As of 2018, he is receiving an annual salary of $21.5 million from his present team. Similarly, he will make $21.5 million for the upcoming season. Along with his incomes from baseball, he too earns massive amounts through his endorsing brands like Nike, Oakley, New Era, and Gap. As for riding, he has lists of cars like Mercedes Benz G Wagon, Rolls Royce, Audi R8 V10 Spyder. In January 2018, Kemp listed his 15,884-square-foot mansion in the Heritage Estates, a guard-gated community in Poway, back up for sale, asking the price is $7.95 million. He purchased the house in 2013 for $9.075 million. Further, he spent about $3 million to upgrade. Further, he sold his Paradise Valley, Arizona house for $3.135 million in 2015.